MURTABAK is a hearty and traditional mamak meal that is nutritious and favoured in Malaysia. 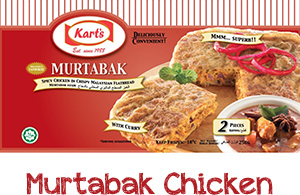 Kart's Murtabak skin gives this product a crispy bite. Filling is made up of minced chicken cooked with egg, onions and spices to give it a distinctive aroma and lingering flavour. 1. Add 120ml water to Fish Curry.